My name is Lynda and I am an addict. My preferred substance is even stronger than fountain Diet Coke and music from the 60s. There is no 12-step programme and even if there were, I am not interested in rehabilitation. My problem has become particularly intense since I retired and now have the time to truly indulge myself. I am a magazine junkie. I buy them, I read them, I hoard them and blow my money on them every chance I get. My pulse quickens when I encounter ancient magazines in doctors’ offices, big fat fashion magazines in hair salons and salacious dog-eared gossip rags on the dirty coffee table where I get my car detailed. No sources are beneath my enjoyment. It started with a simple subscription to Chatelaine many years ago. That felt so good, I soon had to up the ante and ordered a Canadian decorating magazine, then another. Despite subscribing to no less than 17 monthly publications, I still want more and can justify them shamelessly. 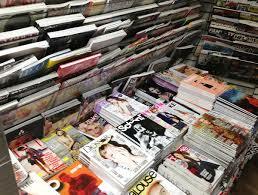 Magazines purchased at the grocery store are not magazines; they are groceries. I have scoured the internet trying to source out-of-date magazines at bargain basement prices. Reading month-old material doesn’t bother me in the least – (see “doctors’ offices” above). Seeing out-of-date magazines being packed up in the drug store (an appropriate venue) for return to the publishers to make room for the next month’s edition breaks my heart. Why won’t they just let me take them home. I’d love them. I’d cherish them. I’d run my fingers lovingly over their beautiful, glossy coloured pages. I spend some of the winter months in Florida which provides me with a U.S. address to further feed my addiction. And it’s encouraged by pitiless American junkie publishers who are continually offering me “deals”. My e-mail is frequently bombarded by tantalizing offers I cannot refuse. I’m immediately hooked on subscriptions for three magazines for a total of only $14.00 per year – for all three. How could I refuse offers of a 1-year subscription for only $5.00!! 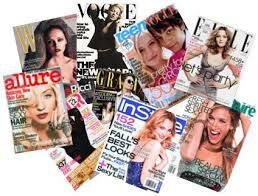 That includes high-end glossy magazines that retail for $6.50 per copy at the newsstand! A few years ago, J.C. Penney offered me my selection of three magazines for a mere $5.00 in total. And two of them are still coming. I can now order my favourite British mags to read on my IPad for a fraction of what they cost at Chapters, and sooner than it takes for them to arrive in hard copy. And now, my local library also offers magazines available for downloading, the high-tech version of my drug dealer. The downside of reading them on my IPad is that I can’t rip pages out and file them. And unless I have a special printer from Apple, I can’t print them either. Special highlighter pens with a cartridge of Post-Its in the barrel are always by my side. My magazines are riddled with skinny Post-Its flagging the pages I have marked for future reference. I buy those pens in bulk and have them planted all over the house. Much as I try periodically to get a grip on my habit, it persists. Like the sirens’ song, my magazines beckon. If the postal carrier doesn’t produce at least one score in my mail box every day I get the shakes. And when there’s a bonanza day with three or four, I can’t wait to put the kettle on. Then I get out my high-lighter pens and go to work. I have a well-rehearsed system for reading them. The first run-through is to simply peruse the visuals – no reading of particular articles allowed at this stage. That’s what the post-it flags are for. Later, during the second reading, I take my time and read each advertisement, every letter to the editor and every article page by page. I rarely skip anything. My girlfriends love my addiction. Every few weeks I purge my stash and pass the expunged copies along to friends who in turn pass them along to more friends. Before passing them on, I tear out high-lighted pages for filing in a special blue toile case subdivided into such categories as Hair, Makeup, Clothes, Livingroom Furniture, Bedrooms, Kitchens, Paint Colours, and so on. Tearing out pages does tend to be a sore point for friends who complain about missing vital pages of an article they want to read that I’ve archived. In my next life I want to be a magazine editor. Instead of writing letters to the editor after the fact, I would be the Anna Wintour in charge of getting my own way, with plenty of free product to boot. I get high just thinking about it. I only hope it leaves me enough time to devote to my other addiction – books! Oh – and purses. Don’t get me started. Next PostHow to rock on . . .
Do you suffer from opioid constipation? And you gave me grat tips, too! I am happy about this addiction..